This article originally appeared on This Dog's Life, a discovery platform highlighting amazing brands while providing dog lovers original, local and national content along with curated stories from across the web. Please follow us on Facebook or Twitter. 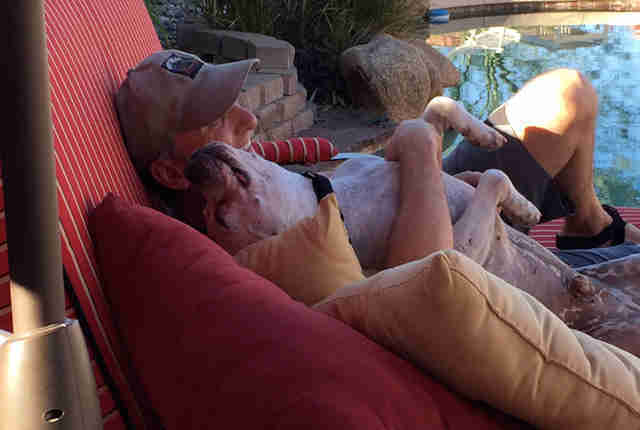 After waiting more than 400 days in a shelter and traveling 2,500 miles, Murdock, the former bait dog that captured the hearts of thousands, finally found his forever home. After recently losing their golden retriever Lexie, Ed and Cheryl of Phoenix (for privacy reasons they did not want their last name disclosed) were going to wait awhile before bringing another dog into their family. But after reading about Murdock's story online, they began to second guess their decision. 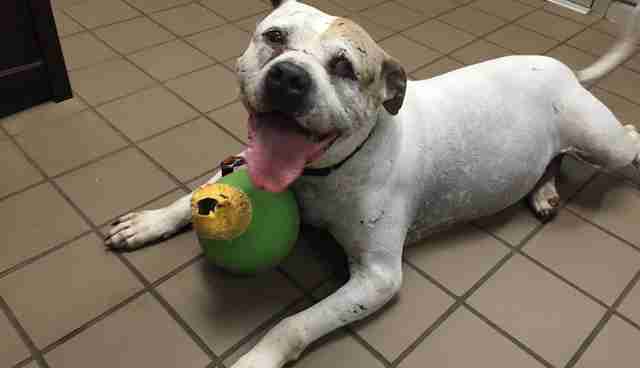 Murdock was brought to Town of Hempstead Animal Shelter on Long Island, NY in July of 2014, after his owner was arrested on charges of dog fighting. 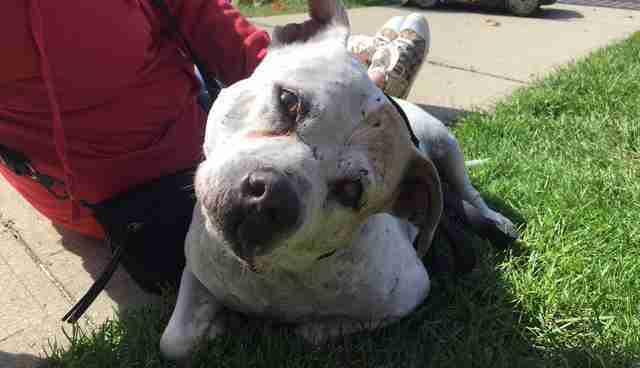 It is believed Murdock was used as a bait dog to build up the confidence of "lead" fighting dogs. These dogs often are unable to fight back, as their teeth are usually ground down or their mouths taped shut. Volunteers think both techniques were used on Murdock. The scars left by teeth are still evident on his face, one of his ears is torn off and he lost vision in his left eye. Upon arriving at Town of Hempstead Animal Shelter, Murdock had to remain in isolation for eight long months while the case against his owner settled. Despite his outwardly scars, staff at the shelter fell for him. "He is a love, a mush, a kisser, a cuddler and everything you'd expect from your furry best friend," they said. After his owner pled guilty, Murdock was finally "freed" from captivity and volunteers worked feverishly to find him a home. 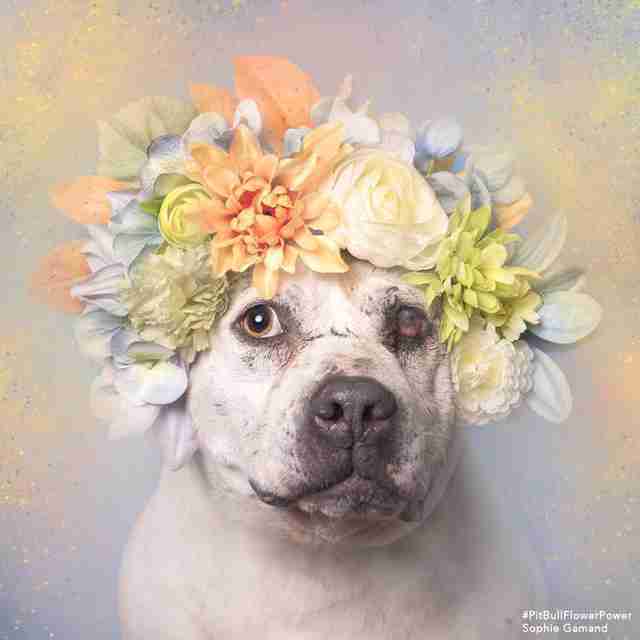 While his story received national attention and Sophie Gamand photographed him for her famous Flower Power series, there wasn't a lot of interest in Murdock. He was transferred to another shelter, Last Hope in Wantagh, N.Y., to provide slightly improved conditions - a bigger cage, more socializing - than what could be provided in his current situation. And there he waited and waited and waited. On Sept. 28, more than a year after Murdock entered the shelter system, Ed picked up the phone and called the shelter. To his delight, a volunteer told him that Murdock has been adopted out. Not long after hanging up and telling Cheryl the good news, the phone rang again. It was the volunteer. She had made a mistake: Murdock was still available for adoption but had been transferred to Last Hope. "If she hadn't taken that extra step, this would have never have happened," Ed tells us. The pair got in contact with Last Hope and began the process of bringing Murdock home. "I have never met so many compassionate, completely dedicated animal lovers, every single one of them was just amazing to talk to, one in particular was John Esposito," Ed says. "John was a real keystone in the visibility that Murdock received and ultimately us adopting him." Esposito knew that Murdock was a special case and took a hard look at Ed and Cheryl. 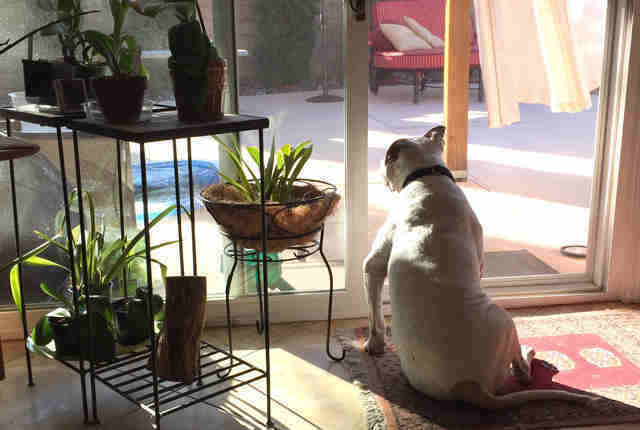 Through the screening process he learned that not only was the couple dog lovers, but they were experienced, dedicated owners. 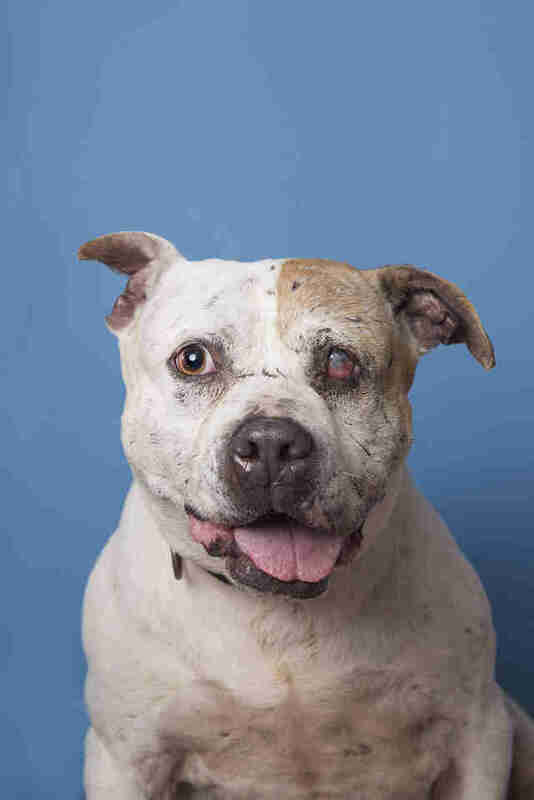 Their previous dog, Lexie, had been returned to the shelter five times before finally living out her last years at their Phoenix home. "She had very unique quirks and things about her that if you want a dog to fit into your ideal world and be what you expect it to be, then I just think you are setting both the animal and yourself up for failure," Ed says. In the 20 or so years owning dogs, they also had an Alaskan malamute, a breed not for the novice owner, a rottweiler mix (some may believe a "dangerous" breed) and had trained one of their dogs to be a wilderness search and rescue dog. "We had a lot of experience with a variety of dogs and training," Ed says. Esposito was candid about Murdock, explaining to the couple his past, his limits (must go to an only-dog home) and the fear aggression he has towards some dogs. His background didn't faze the couple. "We knew in our hearts that when we adopted our next dog, it would one that didn't get all the attention, like some other dogs, and it would be a special circumstance," Ed says. "Somebody that other people would just pass by. And with Murdock's physical scars, I bet a lot of people would shy away from him." 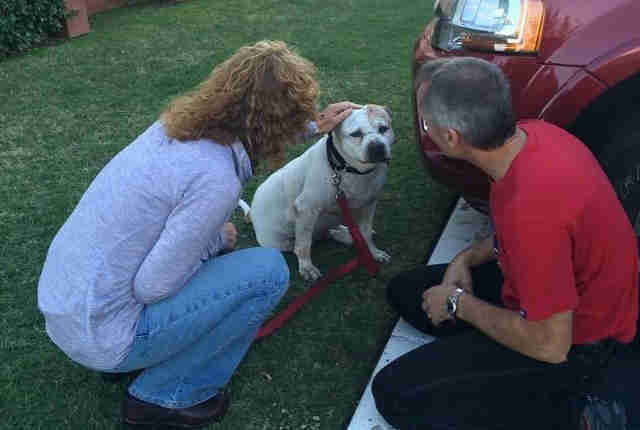 Esposito had an acquaintance do a home visit in Phoenix and after getting the green light, it was up to him to convince Last Hope's board that this was a viable opportunity for Murdock to get adopted. Setting the wheels in motion. Esposito got the thumbs up. 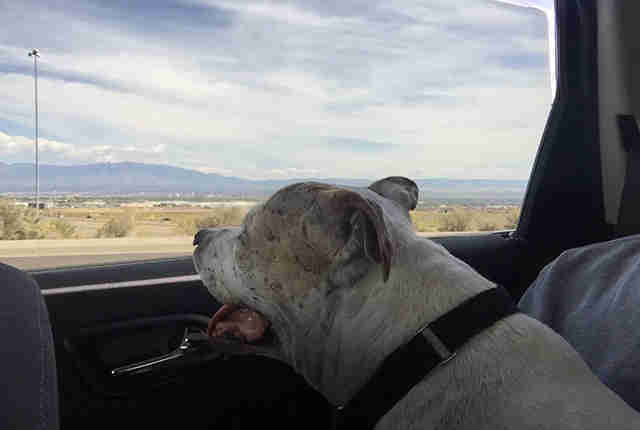 So, he, along with another volunteer, Terri Lynne Trythall-Rizzi, rented a car and made the long trek from Long Island to Oklahoma City, the location where Murdock would meet his new family. Ed and Cheryl flew out from Phoenix and rented a car to bring their new dog home. Waiting patiently at a hotel, they finally got to meet him. "We were outside waiting for them to come into the hotel parking lot, and when they drove up, he already had his head out, checking everything out," Cheryl says. "We were like 'Oh my God, he is so cute!' He was just precious." Murdock knew this was his new beginning. He went right up to the couple, sniffed them and was intrigued. He then leaned on them and trusted that they would take care of him. After spending the evening and morning with the Last Hope volunteers, Ed, Cheryl and Murdock began the last leg of the journey. "Murdock did a three-day 2,500 mile car ride, and he was a champ," Ed says. "We have had dogs for a long time and this dog traveled better than any dog we've ever had." Ed and Cheryl knew they had to make their home Murdock's home. "We had to figure out what Murdock needs, what his home needs to be like and were going to make our home Murdock friendly, instead of expecting him to be perfect and fit exactly in the way we think he should in ours," Ed says. It seems like they did a good job. Upon entering the home, Murdock was not timid or meek; rather it was like he had been there before. "He completely made himself at home as if, I know this is my forever home and here I am," Cheryl says. For the first week, Murdock didn't leave the house. Cheryl and Ed wanted him to get used to the yard and home, which was obviously much bigger than the crate he had been living in for the last year. He has access to a doggy door and loves to just wander outside. He is well trained, hasn't had any accidents in the home and loves to chew on toys - but they need to be Murdock tough. "He will disintegrate any sort of 'normal' dog toy in less than two minutes - the stuffing is out of it, the legs are off it, the squeaky thing is dead," says Ed. So, the couple lets him gnaw on Kongs, which feel good on his teeth. And when he gets tired and wants to show some love, he enjoys curling up on one of their chests, putting his head against the nape of their neck and falling asleep. He also enjoys giving them kisses. "He loves to give kisses and always very sweet and gentle, says Ed. "It is really precious." He continues, "Murdock almost has the ability to show appreciation for any little thing. If you show him a little love and affection, his response is just so much more love back. 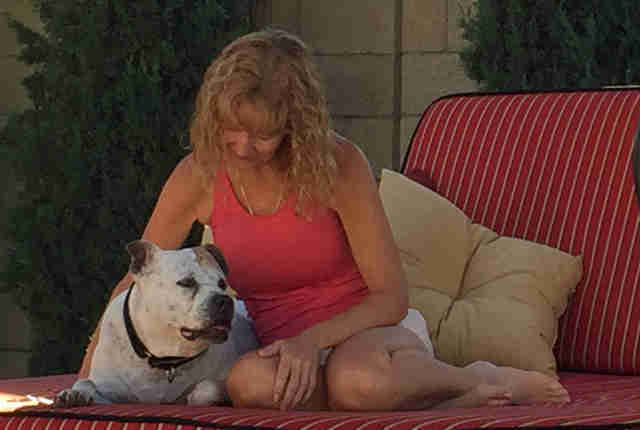 While Murdock had overcome horrendous abuse, painful physical ailments and a long isolation period, challenges still lie ahead for this pit bull. Because of his history, Murdock still thinks some dogs want to hurt him. As Cheryl and Ed have begun to walk him around the neighborhood, they are extremely cautious, as they don't want to put him in situations that make him feel fearful or threatened. While he does fine with dogs across the street, behind gates and fences, Murdock does tense up when he encounters dogs. The couple will soon begin working with a trainer to help reduce his anxiety. "I think it comes down to you need to be a responsible pet owner, says Ed. "I don't think there is anything unique to Murdock, it is just he had an irresponsible owner before that did some horrible things to him." Ed and Cheryl will continue to get to know Murdock, his quirks and provide him with the life he deserves. "I am really happy everything worked out. He is just a sweet, sweet dog and hopefully, we can give him the absolute best life possible," Ed says. "He will be spoiled; I can guarantee it."